The best granny flats are fully self-contained allowing your visitors the privacy they desire when they come to stay, and giving you more options with what to do with your space. Perhaps you built your granny flat purely as guest accommodation, or maybe you created a separate studio space as a home office, music room or kids/teen hangout? Whatever the case, when your granny flat is fully independent, one very lucrative option is opened up to you: rental potential. Granny flats as viable rental solutions and passive income streams is increasing in popularity and one way to ensure that this option is possible for you is to make sure your granny flat is fully independent! Now, that list might seem like a lot of spaces and you’re probably thinking “how can I possibly fit that all into my granny flat?” Well, the answer is simply to be smart with your space. In terms of layout, you can think up, out, across, sideways, the options are endless! The main thing to keep in mind is what will work for you and your requirements. If you are planning to have elderly relatives come to stay, you’ll need a single-storey layout. If you want to create additional spaces and perhaps more than one sleeping zone, a multistorey option could be for you. To really maximise your space, use multi-functional furniture and be clever with what your furniture can do. Consider furniture that can do two jobs in one. The space below features a desk and study nook by day, then the “wall” behind the desk folds down to be a bed by night! Sofa beds are another nifty piece of furniture that provides you with two uses in one. One thing that can often be tricky in granny flat applications is the plumbing. Some property owners are lucky to have their desired granny flat space within accessibility of their existing sewerage, however many aren’t. 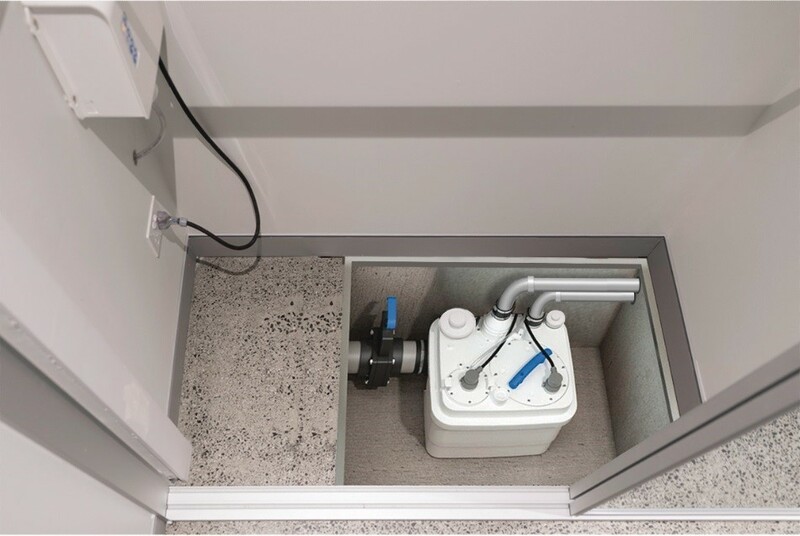 To get around this issue, Saniflo provides an innovative plumbing solution that easily connects your new granny flat wet areas to the sewerage mains. For a complete granny flat, a solution like Saniflo’s Sanicubic 1 is ideal. With the ability to connect to a toilet, shower, sink, bathtub, washing machine, dishwasher and a kitchen sink, the Sanicubic 1 makes a complete bathroom, kitchen and laundry possible and without major disruptions. The Sanicubic 1 has the ability to pump waste away through slim 40mm pipe-work up to 11m vertically or 100m horizontally, or a lesser combination of both, giving you plenty of options for where to locate your new granny flat! The best part is, the Sanicubic 1 WP is surprisingly compact, so there’s no need to disrupt the existing design of your granny flat and garden. Now that you know your plumbing is possible and you can achieve all the wet areas your occupants will need, make sure you maximise this opportunity. For your ensuite bathroom, including a bathtub and shower maximises potential use. If you’re short on space, position the shower over the bath! A slim vanity and basin, plus a toilet obviously will also add to the usability of your space. For “out of the box” ideas, consider an outdoor shower! This alfresco option will help to create a spacious feeling for your space. However, if you live in a predominantly cold climate, possibly give this trend a miss! The last key element that you’ll want to get right with your granny flat is the storage. 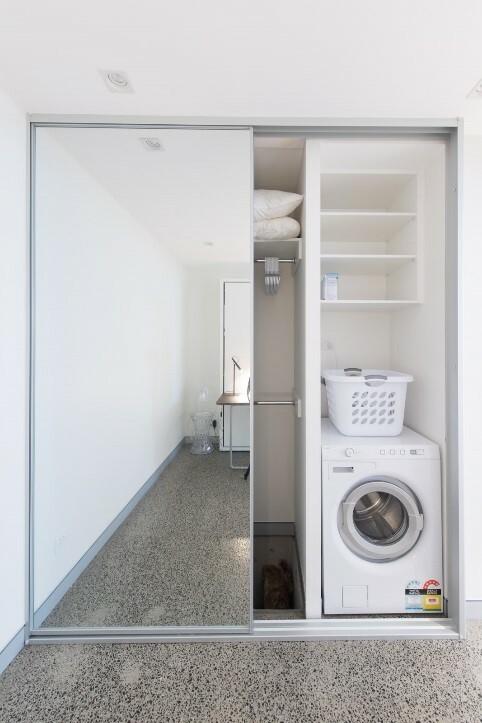 If you have the space, a wardrobe is best for your guests/residents to be able to hang their clothes, and it can also double as a location for a Euro-laundry. For extra space, think strategically. Which areas of your granny flat might have additional space that isn’t being optimised properly? A key area is often under the staircase as this offers space for your belongings! Another smart storage solution is under the bed! Creating a mezzanine level can add an additional “room” to your space, without fully partitioning off the space. If you decide not to opt for a complete mezzanine, a raised bedroom area not only provides a feeling of separation but it also provides ample storage opportunity underneath.